There's still time to back the new S&F Book Project! Sin never did manage to eliminate that brain damage problem from his own scanner. (Although he did manage to get it down to 55%). In other news, in case you missed it: on Friday, I opened a new pre-order store for folks who missed our Kickstarter for Volume 5, and the new Hardcover Omnibus Collection of 1-5! -Bonus packs of postcards and pins! -Some of our more popular t-shirts! If any or all of this strikes your fancy, head on over to the pre-order store. All our pre-orders will ship alongside Kickstarter backer orders later in the spring! Good news, Chris (and others who share his predicament and sentiment)! We've opened a new pre-order store for folks who want to become "slacker backers", as Double Fine famously (and affectionately) coined them. You can order your copy of Volume 5, or the new Hardcover Omnibus Collection of 1-5, and we'll send 'em out when we send out all our backer rewards later this spring! In the pre-order store, you'll also find most of the other rewards and add-ons that were available during the campaign, including Artist Edition copies, bonus packs of postcards and pins, all our previous books, and other fun stuff. You can also claim one of our two remaining unclaimed pin-upy commissions. Woo! Haha, not exactly! Mr. Sin has different facial hair for every one of his incarnations. Whenever a particular surface business venture becomes too tainted with customer disatisfaction, legal action, or criminal charges, Sin re-invents himself as one of his own identical twin brothers, chaing his hair and granting himself a new first initial. R. Sin -- the iteration with the big eyebrows -- was the identity he was rocking during the Sin Records era, which is the same time period in which he collaborated with Theo Designer. So that's why Mr. Cin has the same look! We (and Sam) have seen the Buddy Bot "alt mode" Mr. Cin is referencing way back in the climax of Sam and Fuzzy Are Very Famous. Mr. Sin diligently programmed such a mode in all his Buddy Bot itterations. It's just common sense! In other news, my January Patreon rewards are out! 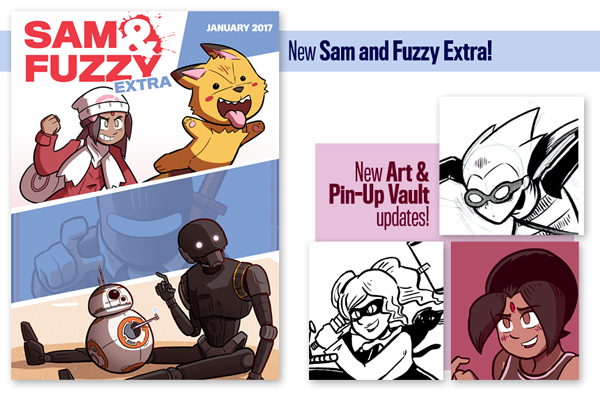 There's a new bonus art poll for all backers, a new issue of the Sam and Fuzzy Extra e-magazine for $5 backers, and an pin-up and concept-art infused Secret Art Vault update for $10 backers. Enjoy, backers, and thanks for your support of my work! We return on Friday with our next comic, and a new round of reader Q and A. (If you've got a question for me, just pop it in an email with "Q and A" in the subject line.) See you then!